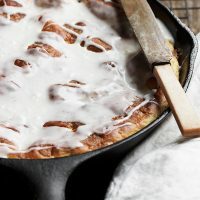 A quick and Easy Cinnamon Roll Coffee Cake, with all the flavours of cinnamon rolls, but made in one pan in under an hour! There’s a whole class of yeast baking that’s more of a cake than a bread – a yeasted coffee cake, if you will. The dough is more of a batter. The end result more of a cake. The process, quick and easy. If you’re a nervous yeast baker, this is definitely a great place to start, as there is no-kneading and it’s pretty much foolproof. 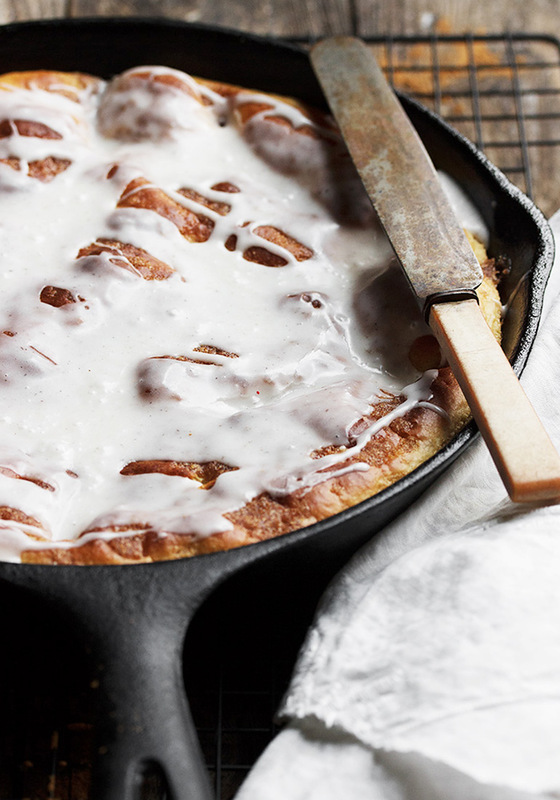 This easy skillet cinnamon roll bake has all the flavours of cinnamon rolls, in a quick and easy one skillet (or pan) bake. Great for a weekend morning treat, as it’s ready in less than an hour! 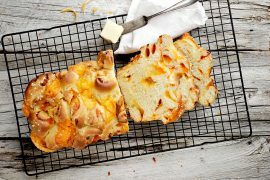 Again, there is absolutely no kneading required for this yeast cake and if you’re an experienced bread baker, you’ll want to throw out any notion of creating a kneadable dough when you mix it up. This is definitely a batter. And while you can mix this batter up right in the skillet you will bake it in, you could also mix it in a separate bowl or even a stand mixer with a paddle attachment, if you prefer. DID YOU KNOW? This recipe calls for Rapid-Rise Yeast, also known as Quick Rising Yeast. Not only is it quick rising, it is intended to work well with only one rise (as opposed to the two rising periods that is typically used when making yeasted goods). While baking with Rapid-Rise Yeast is quicker, it is not suited for all yeast baking. 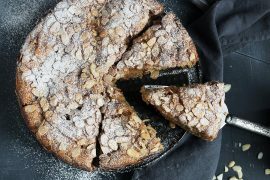 It is best suited for recipes like this one (coffee cakes, pancakes, waffles), where you don’t need the benefits of two rising periods to develop texture or flavour. 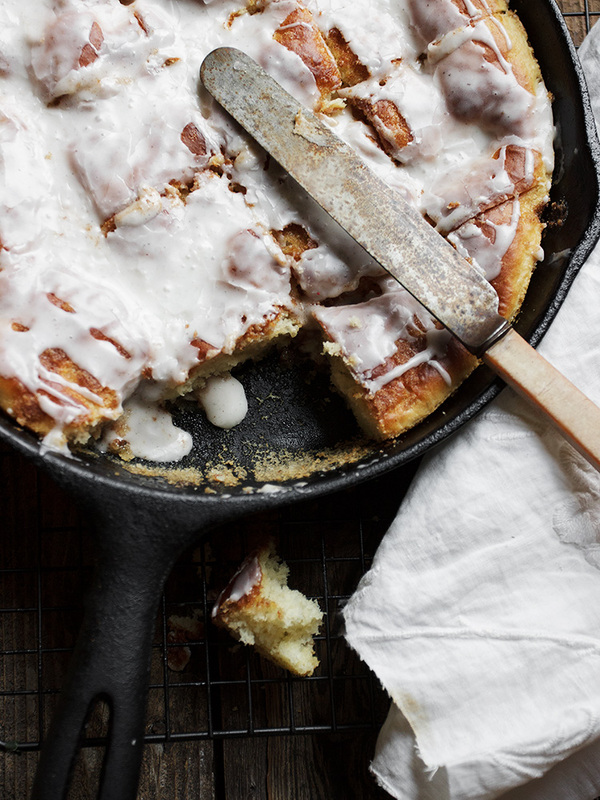 A quick and easy skillet coffee cake, with all the flavours of cinnamon rolls. No-kneading required. Made in one pan and ready in less than an hour. 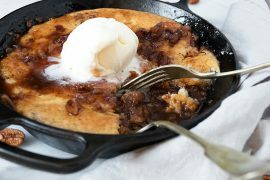 Mix the batter ingredients together in a greased 10-inch skillet or 8x8-inch pan. Let batter rest for 15 minutes. Meanwhile, in a small bowl, combine the ingredients for the cinnamon mixture by mixing with fork. Top batter evenly with cinnamon mixture, using your fingers to poke the topping thoroughly into batter. Place baking pan/skillet into a COLD oven, then immediately set the oven temperature to 350° F. Bake for 25-30 minutes, or until lightly browned and firm in centre. Cool for 10 minutes. Combine icing ingredients and drizzle over warm cake. Hi Jennifer, I am wondering if this technique of putting the cake in a cold oven will work in a gas oven. I used to use this technique for a pizza when I owned an electric oven but the recipe did not work anymore when I move to a house with a gas oven. I read somewhere that it might have something to do with the different venting of electric vs. gas. Lol! So glad to hear! I think that may be more times than I’ve made it, but that’s only because I have to keep baking new things :) I understand why you love it though. It’s a favourite of mine, too. Thanks! 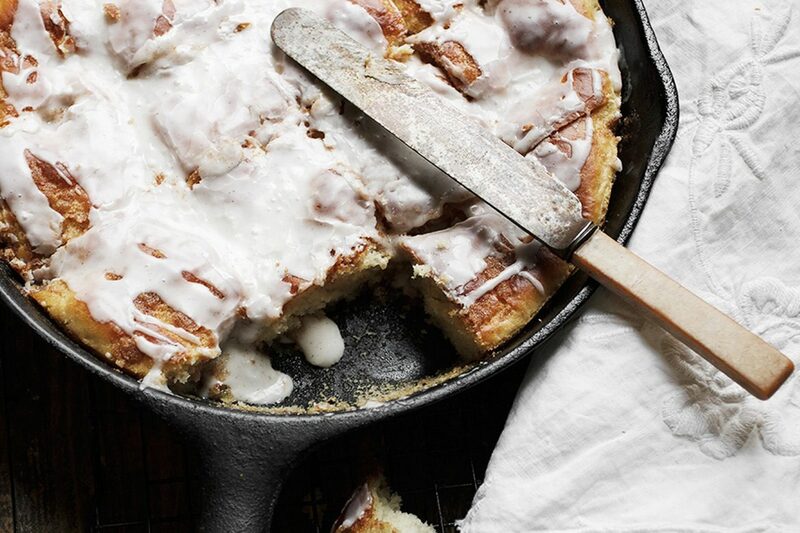 Do you think this recipe could be scaled up to make several 8″ pans? Hi Jennifer I can’t wait to try this recipe!! My only question is, do I mix the flour and yeast mixture by hand or do I use an electric mixer? Hi Chatwaeya, you can mix this up right in the skillet, if you like. Or in a separate bowl or in a stand mixer with the paddle attachment. It is more a batter than a dough, so it mixes up easily. Hi Jennifer, I made the cake in an 8 inch square pan. The recipe is amazing! It is quick mixing all the ingredients in the baking pan and the cake cut into rolls and tasted amazing. The result was loved by kids and adults. I did use a cream cheese frosting because it is what the kids prefer. Thanks. Hi, can I take the cake in an 8 or 9 inch cake pan? Do I need to grease the pan? OMG ! Jeniffer. This is soooooooooooooooo good ! And easiest ever I was experienced . I don’t have to even deal with Bread Machine either. And result tasted are exactly Cinnamon Bread Roll ! I can’t believe it. Thank you so much for your excellent recipe always. Definitely my repeat favorite recipe !! Hi Yuri! So glad you enjoyed this :) It really is easy and a wonderful little cake for so many occasions. I make it often myself. Thanks!